Stephen Myler and Luther Burrell return from injury to take their place in the Saints team to travel to Harlequins on Saturday (kick-off 3pm). Burrell has been out since being knocked unconscious in the defeat at Saracens on September 17, while Myler was a late withdrawal ahead of the win against Exeter last Friday due to a shoulder problem. Tom Wood is also back to skipper the side after being rested against the Chiefs, while Teimana Harrison comes in for the benched Louis Picamoles at No.8. Ahsee Tuala replaces Ben Foden, who is among the replacements, at full-back. 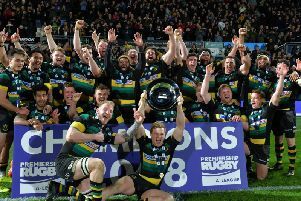 It is a strong Saints bench, with Lee Dickson returning from a groin injury and Harry Mallinder likely to get a cameo after his heroic match-winning penalty last week. Dylan Hartley remains out with a back injury, with Christian Day (bicep) and JJ Hanrahan (ankle) among the others still sidelined. Meanwhile, Harlequins remain shorn of scrum-half Danny Care, who has a rib injury. But Nick Evans is fit enough to return to the starting 15 at fly-half. Harlequins: Brown; Yarde, Alofa, Roberts, Visser; Evans, Dickson; Marler, Buchanan, Sinckler; Merrick, Horwill (c); Robshaw, Wallace, Chisholm. Replacements: Gray, Lambert, Collier, Twomey, Luamanu, Mulchrone, Swiel, Marchant. Saints: Tuala; K Pisi, G Pisi, Burrell, North; Myler, Groom; A Waller, Haywood, Brookes; Lawes, Paterson; Wood (c), Clark, Harrison. Replacements: Clare, E Waller, Hill, Dickinson, Picamoles, Dickson, Mallinder, Foden.